When watermelons were bursting like bombs in Eastern China because the farmers there gave overdoses of a growth chemical to the fruit, the picture in my mind made me laugh. The same when it was reported that petting pets if you have hormone cream on your hand can be dangerous to the pet. Then I came to my senses and realized the situation on both cases is serious. A hormone is a chemical produced by a gland secreted into the bloodstream affecting the function of distant cells or organs. US beef producers have been using growth hormones, very powerful chemicals from the pituitary gland at the base of the brain, to increase the weight of cattle by 10 to 20 percent for the same amount of food. The 12 nation European community had earlier put a ban on US beef because of our use of growth hormones in raising cattle for meat. Some Chinese farmers, evidently thought growth hormone may make their watermelon grow big and juicy. The Chinese farmers gave the fruit the chemical during wet weather creating what the Chinese State News media called field of “landmines”. 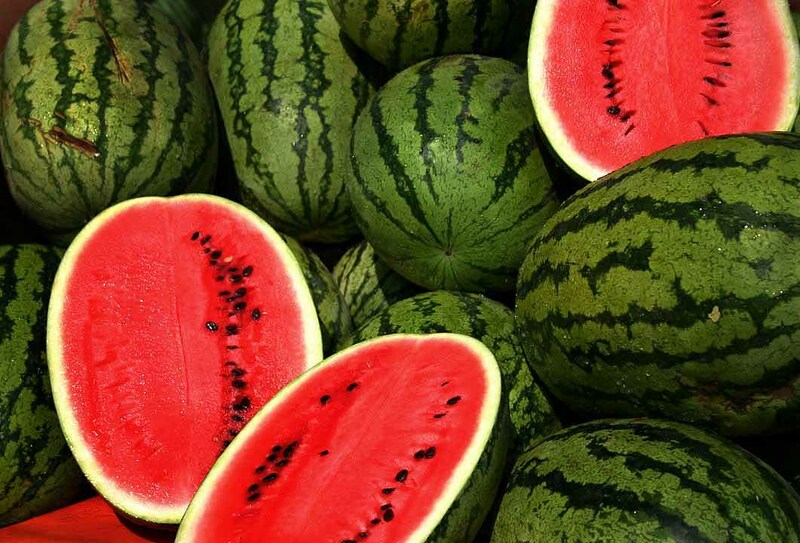 The common name for the growth chemical used on the watermelon and other fruit is forchlorfenuron. It supposedly improves fruit size, cluster weight and cold storage in grapes, raisins, kiwifruits as well as watermelon. US Environmental Protection Agency (EPA) considers forchlofenuron a pesticide. The EPA fact sheet says of this chemical: “the only effect observed in developmental study in rats was increased incidence of alopecia (hair loss) and decreased in maternal and fetal body weight.” As for endocrine disruption, a big problem world-wide, the EPA determined that there was a scientific basis for including forchlorfenuron as part of the testing program for the androgen and thyroid hormone systems, in addition to the estrogen system. Why is forchlorfenuron necessary? It isn’t unless you like exploding watermelon and bigger kiwis. Women produce about a half teaspoon of the female hormone, estrogen, in their life times so it is very powerful chemical. Veterinarians around the country are now reporting spayed and neutered pets becoming hormonal. In their journals the vets are writing cosmetic estrogen creams appear to be the most common contributor to animal hormonal disorders. According to Dr. Margret Casals, Associate Professor of Medical Genetics with the Ryan Veterinary Hospital at the University of Pennsylvania, a dog or cat could lick the cream off an owner’s skin or simply absorb it through their skin when the owner pets the animal. Dr.Casal says estrogen exposure, over a long period, can be fatal to dogs. “In the worst of all cases it can actually wipe out the bone marrow, and the bone marrow is a source of all the white and red blood cells,” she noted. 1. Contact the EPA and say you don’t want bigger fruit to which growth hormone has been added. 2. Don’t use estrogen laden cream unless it is for medical purposes. Make sure your wash your hands of any of your “anti-aging “creams because many of them contain hormone-like ingredients before your pet your pet. 3. Pet your pet with clean hands. Previous Post WHAT ARE THE CHEMICALS IN YOUR HOME, OFFICE AND BACKYARD?